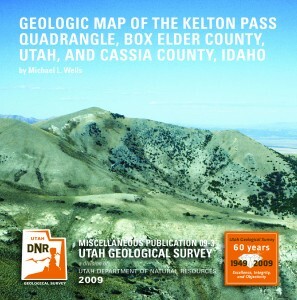 The digital database on this CD was derived from plate 1 of U.S. Geological Survey Bulletin 1125, published in 1964, with many modifications and additions by the Utah Geological Survey. 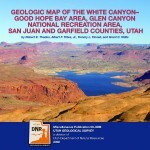 The map depicts gently folded Pennsylvanian, Permian, Triassic, and Jurassic strata exposed in the White Canyon, Good Hope Bay, Hite, and Red Canyon areas in and near Glen Canyon National Recreation Area, and includes parts of a large historical uranium mining district. The Kelton Pass quadrangle, located at the east end of the Raft River Mountains, is a classic metamorphic core complex, in part exemplified by the Raft River detachment fault. The area contains Archean metamorphic, Proterozoic metasedimentary, and Paleozoic carbonate and clastic rocks that were intensely deformed and thinned by alternating episodes of contraction and extension during the late Mesozoic to Cenozoic. Miocene to Quaternary sediments fill structural basins, and late Pleistocene Lake Bonneville deposits blanket low areas. 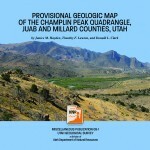 The Champlin Peak quardrangle is located in central Utah within the eastern Basin and Range Province, and includes the northern Canyon Mountains, southeastern Gilson Mountains, and Sevier and Leamington Canyons. The map area displays structures of the Sevier fold-thrust belt, including the Canyon Range syncline, Leamington Canyon fault, Tintic Valley thrust fault, and Leamington antiform. Cretaceous conglomerate, derived from thrust sheets durin Sevier deformation, unconformably overlies Cambrian strata of the Canyon Range thrust plate. Surficial deposits include alluvial fans, fluvial sediments of the Sevier River, and deltaic sediments of Lake Bonneville. Limestone, shale, and quartzite are quarried for use in a local cement plant. This CD contains three plates: the geologic map at 1:24,000 scale and two explanation plates, all in PDF format. Adobe Acrobat Reader is required for viewing the plates and can be downloaded at www.adobe.com.